Solving the puzzle sometimes requires shuffling those letters around again and again. We know the feeling, it happens to us as well.. . But thanks to your helpful word play through our feedback form, we are able to improve the game through new features and fixes. We couldn&apos;t have done this without you.. . Enjoy and keep those letters flying! You go heads-up against other random players or start playing words with friends to beat them. Don&apos;t make the assumption you are better than they are. This game is like the old word board games found on your attic. If you were the annual spelling champion, this game is the perfect asset for you. Do you love word puzzles? 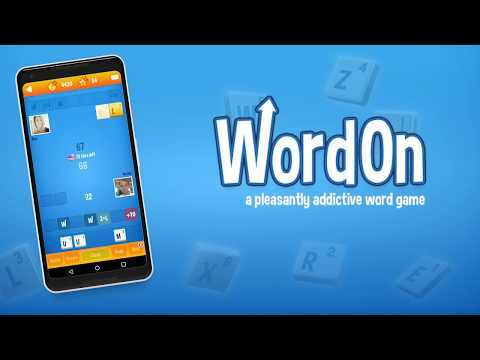 WordOn is a pleasantly addictive word game to take with you wherever you are. Enjoy in small bursts or take your time to find the best possible words in this word game. Dyslexic? No problem, this game helps out you and you&apos;ll start learning new words as well as classic words while having fun at the same time! Will they be able to use them and get a bonus, or did you just strategically win the word game..? Look for the right words and connect the letters in WordOn. And if you win, look for a flagpole to celebrate your win! Even for dyslexic people, this is the fun word game to look for as using the in-game tools and tips will help you out a lot.